Generation of electricity by hydropower (potential energy in stored water) is one of the cleanest methods of producing electric power. In 2012, hydroelectric power plants contributed about 16% of total electricity generation of the world. Hydroelectricity is the most widely used form of renewable energy. It is a flexible source of electricity and also the cost of electricity generation is relatively low. This article talks about the layout, basic components and working of a hydroelectric power station. 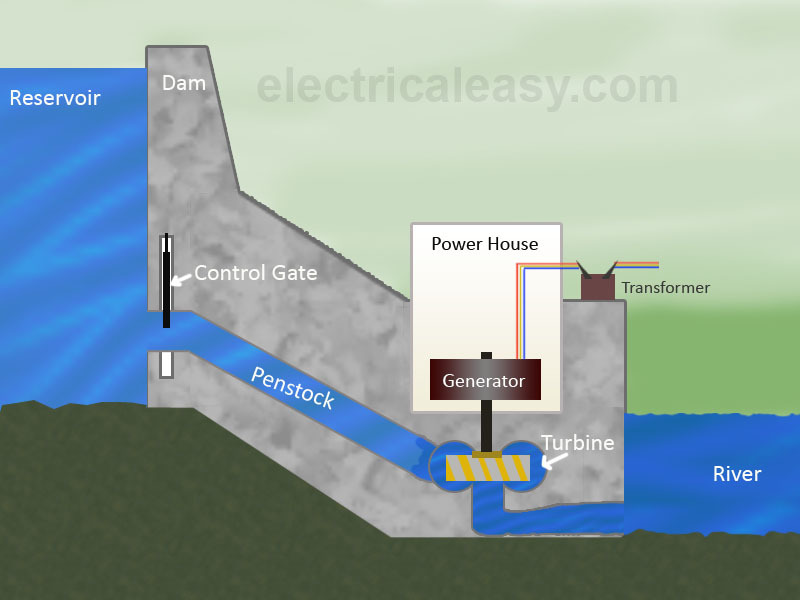 The above image shows the typical layout of a hydroelectric power plant and its basic components. Dam and Reservoir: The dam is constructed on a large river in hilly areas to ensure sufficient water storage at height. The dam forms a large reservoir behind it. The height of water level (called as water head) in the reservoir determines how much of potential energy is stored in it. Control Gate: Water from the reservoir is allowed to flow through the penstock to the turbine. The amount of water which is to be released in the penstock can be controlled by a control gate. When the control gate is fully opened, maximum amount of water is released through the penstock. Penstock: A penstock is a huge steel pipe which carries water from the reservoir to the turbine. Potential energy of the water is converted into kinetic energy as it flows down through the penstock due to gravity. Water Turbine: Water from the penstock is taken into the water turbine. The turbine is mechanically coupled to an electric generator. Kinetic energy of the water drives the turbine and consequently the generator gets driven. There are two main types of water turbine; (i) Impulse turbine and (ii) Reaction turbine. Impulse turbines are used for large heads and reaction turbines are used for low and medium heads. Generator: A generator is mounted in the power house and it is mechanically coupled to the turbine shaft. When the turbine blades are rotated, it drives the generator and electricity is generated which is then stepped up with the help of a transformer for the transmission purpose. Surge tanks are usually provided in high or medium head power plants when considerably long penstock is required. A surge tank is a small reservoir or tank which is open at the top. It is fitted between the reservoir and the power house. The water level in the surge tank rises or falls to reduce the pressure swings in the penstock. When there is sudden reduction in load on the turbine, the governor closes the gates of the turbine to reduce the water flow. This causes pressure to increase abnormally in the penstock. This is prevented by using a surge tank, in which the water level rises to reduce the pressure. On the other hand, the surge tank provides excess water needed when the gates are suddenly opened to meet the increased load demand. Conventional plants use potential energy from dammed water. The energy extracted depends on the volume and head of the water. The difference between height of water level in the reservoir and the water outflow level is called as water head. In pumped storage plant, a second reservoir is constructed near the water outflow from the turbine. When the demand of electricity is low, the water from lower reservoir is pumped into the upper (main) reservoir. This is to ensure sufficient amount of water available in the main reservoir to fulfil the peak loads. In this type of facility, no dam is constructed and, hence, reservoir is absent. A portion of river is diverted through a penstock or canal to the turbine. Thus, only the water flowing from the river is available for the generation. And due to absence of reservoir, any oversupply of water is passed unused.